With the grey and long winter, it is always appreciated to get some colour on your plate. 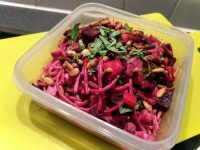 One of the most convenient ingredients in winter for doing that is beetroot. They are in season and therefore cheap to buy and they are full of colour. 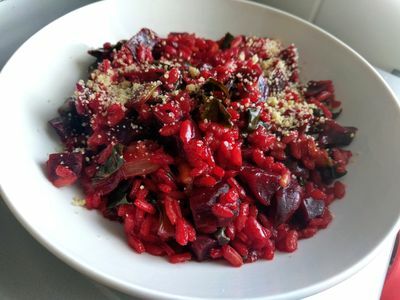 After sharing the recipe of spaghetti with beetroots, this time is the risotto made with beetroots and spinach. 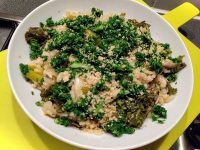 The dish is really pleasant to look, really tasty and on top of that, it is gluten-free and vegan. 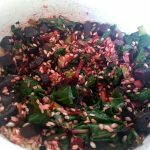 How to make a Risotto with beetroots and spinach? 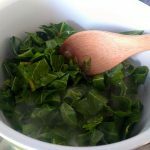 If the spinach are huge, it is better to chop them before adding them into the pan, so there are spinach on all the risotto and not only in one place. 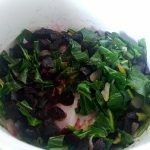 Beetroot was fine, not too dry, but don’t skimp on the olive oil. 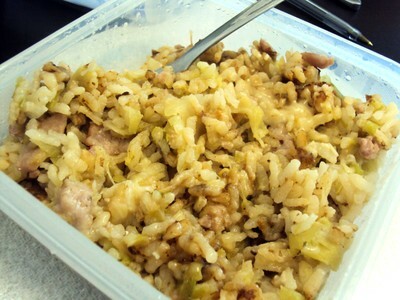 I was a little apprehensive about the oven method as risotto making is quite restful cooking so I did the usual stirring method and it was really good, stunning colour too. 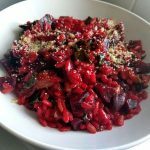 We love beetroot and I will definitely add this to my risotto list. The dill and sour cream work perfectly.